Paul Merson rates winning promotion to the Premiership with Pompey as his best achievement in football. The midfielder won the FA Cup, League Cup, European Cup Winners’ Cup and domestic titles during a glittering spell with Arsenal. Merson was also named in England squads at the 1992 European Championships and the 1998 World Cup. But the 21-cap international revealed winning Division One in 2003 at Fratton Park is the highlight of his career. Merson made the move to Pompey in the summer of 2002 following his release from Aston Villa. The majestic midfielder would prove influential as the Blues were promoted as champions. Harry Redknapp handed Merson the captaincy and he scored 12 goals in 44 games across his solitary season on the south coast. 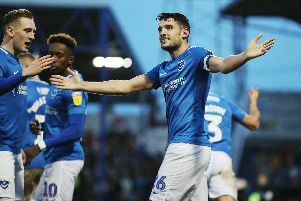 And despite stints at Middlesbrough and Villa, where he reached FA Cup and League Cup finals respectively, he pinpoints his time at Pompey as his favourite. Speaking as a guest at the UCFB Etihad Campus, Merson said: ‘I’d never talked to Harry (Redknapp) in my life. ‘He called me and said he’d be interested in bringing me to Portsmouth for a couple of years. ‘He told me to come down for a couple of years, he’d make me captain and we’d give it a right go. ‘I signed on a Thursday and we played Nottingham Forest at home on the Saturday. ‘There were 19,000 at Fratton Park, you would have thought there were 100,000. ‘We won the game against Forest 2-0, beat Crystal Palace three, Millwall five, Derby six and Coventry four. ‘We smashed everybody out of sight. ‘We got promoted to the Premier League as champions for the first time ever. ‘I won everything at Arsenal, in them days it was called the European Cup when I played in it.